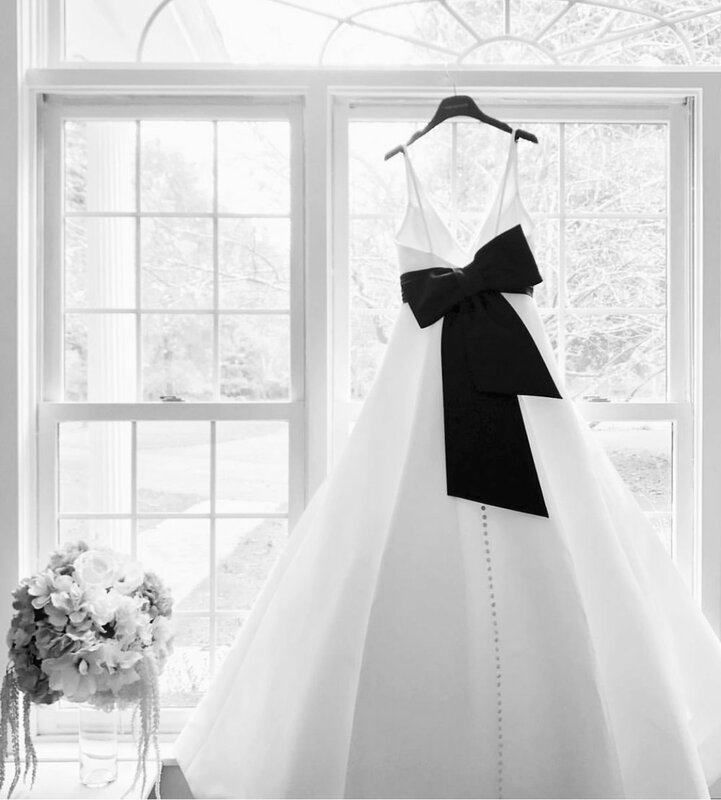 Stella's Bridal doesn't just stop at helping you find the dress of your dreams! We will carry you through until the day you say "I do". Let us help take the pressure off of you, your family and bridesmaids with our three tiers of Luxe Wedding Day Services! Let’s be honest, no matter how long you steam a dress the moment it goes back in the garment bag it is bound to get wrinkled again!! Obviously once the gown is out of the bag and aired out some of those wrinkles will fall. However, you are going to need your dress touched up again (most definitely the train)! We often hear "Wait Stell, so you're telling me that even though I just spent money to get a final steam it will probably be wrinkled anyways?!" Don’t panic! This is where you can choose Stella’s White Glove Service instead. -We come to you, on your wedding day! -We'll provide a full steam to your wedding dress and also touch-up your wedding party's dresses. -We will also help you into your dress or assist with fine details such as buttoning or lacing up your corset. Every bridesmaid or Mother of the Bride secretly panics when it comes to those little details, take the pressure off of them and leave it to us! Not only will everyone have a freshly pressed gown, but we will also stay with you and your bridal party until the ceremony to ensure everyone is flawless the moment they walk down the aisle. So you love our White Glove Service, but you're wanting a little more help on your big day. Not to worry, we thought you might say that! Introducing our Deluxe White Glove Service! You will still receive all of the above perks, but we will also stay with you throughout your ceremony and during your pictures. Could you imagine getting your pictures back and noticing your train isn't fluffed or your bridesmaid didn’t adjust your veil?! We can’t have that, trust us to do all the work! Now, the biggest concern we hear is….. Maid of Honor: “How do I do the bustle?” Talk about pressure! Hooks, buttons, and ribbons (on top of a few cocktails). Instead we will meet you at your final fitting before the wedding, learn the bustle, and bustle you up before the reception! Doesn’t that sound much more relaxing? -All of the White Glove Services. -You will go to my final fitting with me to learn my bustle and stay until my reception to bustle my dress! - Style my girls and I during pictures. -Oh and to top it off you'll even bring a round of mimosas for the girls and I to sip on while you tend to steaming our gowns! -An all inclusive package where we stay with the bride morning, noon and night. -We provide sweets and treats while the bride gets ready in the morning, along with those mimosas! -We are the brides personal assistant throughout the day. -From fixing falling hair, to snapping selfies, fixing the bustle, touching up stains and everything in-between. *Times will vary based on individual wedding itineraries. A typical day will be from the start of getting ready (arrival time requested by bride) through dinner. *Stella's Luxe Bridal Servies will be available to weddings within 60 miles of the shop. Please note a per mile fee will be charged to weddings at locations further than 60 miles. Package pricing will be discussed at first consultation, based on personal needs of each wedding. Please provide at least 90 days of notice to book Stella's Luxe Bridal Services. Thank you!